Zeus | Learn about Greek Mythology,Greek gods,Greek mythology stories! Jupiter or Zeus in Greek mythology is the youngest son of Cronus (hence the patronymic Kronidis referred more to the Odyssey) and Rhea, grandson of Uranus and Gaia. Is the highest deity of the ancient Greek pantheon and the god of sky and thunder. Jupiter has always been a weather god, auditor of lightning, thunder and rain and was also the strongest and most important god of all gods and mythological beings. Theocritus around 265 BCE wrote: "sometimes Zeus is clear, sometimes it rains." In Homer's epic The Iliad send lightning at enemies. Other emblem was the eagle and shield. Zeus is a child of Saturn with Rhea, and brother of the other gods, Hestia, Demeter, Hera, Hades and Poseidon. His birth begins with the pains of Rhea in Crete IDI (PSILOREITI), where she hid the child in the Ideon Andron. Because Saturn/Cronus negated his children, swallowing them immediately after their birth, Rhea fled there following the advice she had given by Gaia and Uranus. When Zeus was born, Rhea tricked Cronus by showing instead of the newborn, a stone wrapped in swaddling clothes, which Cronus swallowed. According to another tradition, Rhea fled to Arcadia in Mount Lykaion, where Zeus was born. Then bathed the infant on the river Lucia, which then flowed for the first time and then went to Crete, where he received the care of Dikteou nymphs, the comrades of the Curetes or Corybantes. In Crete, several caves in one way or another involved in the upbringing or the protection of God. Zeus after appeared before the astonished father, made him drunk and forced to release his brothers. The main Titanomachy. Hesiod carries us on the legendary Clash of the Titans. 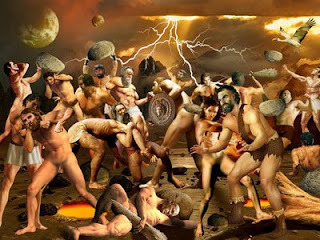 According to the myth, Zeus and his brothers fought against Cronus and the Titans for supremacy on the Earth. Starting from Olympus fought against the Titans who had entrenched themselves in Orthy. The relentless war lasted ten years, until Zeus took the advice of Gaia, to descend to the [Tartarus] to release the brothers of the Titans, the Cyclopes and the Hecatonchires. In Tartarus, Zeus fought the mythical monster Cambe and after he defeated it , freed the Cyclopes and Hecatonchires, who became his allies. The Cyclops in gratitude gave Ares and Poseidon weapons and supplied Zeus with lightning, thunder and hammer, which since then became his symbols of power. And the Hecatonchires escorted Zeus in battle and with their help, the gods defeated the Titans and plummet them to Tartarus, putting on guards, their Hecatonchires. Saturn was imprisoned along with the Titans in Tartarus have a guard the Night, and later he got grace and became king des Champs Élysées, where he slept forever. 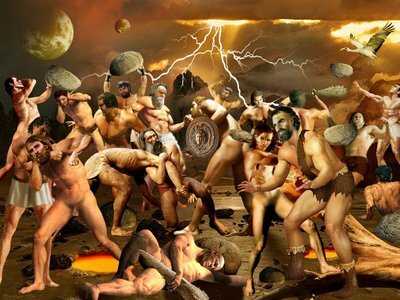 Zeus after proposal from Gaia to the Gods take supreme power and divides the world into three kingdoms: The sky, the sea and the underworld, putting heads on himself, Poseidon and Hades respectively. In his reign, Zeus was threatened by the Giants, who with the instigation of Gaia sought to avenge the fight of the Titans. In the war that followed,which was called Gigantomachy, Zeus emerged victorious. The Olympian gods aided by Hercules and Dionysus fought and defeated all killing or beating the Giants. In Hesiod, the first wife of Zeus was attractive Metis, the goddess of knowledge. But Zeus got an oracle that from his son by Metis one day he would find the same fate as his father (Saturn/Cronus) and his grandfather (Uranus), who were deposed by a child. But since even the method of Saturn had not been proven effective, Zeus decided not to overpower his children, but the very Metis before she had time to give birth. Zeus swallowed Metis, as did Saturn with children of Rhea. But Metis was already pregnant to Athena, and so Zeus after such action,caught him terrible headache. Hephaestus came to the rescue with his tools, and with his help Athena was born, which sprang in full armor from the head of Zeus. Hera, also daughter of Cronus and Rhea, was the third wife and sister of Zeus. Hidden relations before marriage gave them as wrist Hebe, Eilithia (goddess of childbirth), Ares and possibly Hephaestus. Tumultuous their relationship was full of intrigues and rivalries, included even conspiracies or opposition of an against to the will of another. There is a view that the hatred of the pair goes back to the rivalry of the primary pair Uranus - Earth and, of course, reflect the position of the male in the historical years of patriarchy. Derived from the Greek Dios, meaning brilliant. From the Indo-European root * Dyēus, which according to linguists still gave the Greek word God, the Latin Deus, the Vedic Dyaus, the German Tiwaz and other words related to the divine.